Is it heartburn or something else? Many heartburn sufferers worldwide ask this question. 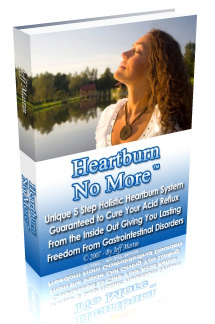 Heartburn is a symptom that produces fear in many people. It could be as sign of something serious or even life-threatening such as heart attack. But all of them definitely require evaluation. It could even be something as simple as a pulled muscle. Other than heartburn or heart attack, chest pain may be caused by stomach ulcers, a panic attack, muscle problems, or pneumonia. Often, the pain caused by severe heartburn episode and that caused by a heart attack is extremely difficult to distinguish even for trained emergency room staff. Heartburn is one of the most common reasons a person goes to the emergency room. While many may be suffering from a heart attack some may be experiencing severe heartburn. · A sharp, burning sensation just below the breastbone. · The pain generally does not radiate to the shoulders, neck, or arms, but in some people it can. · Pain usually comes on after meals, when lying on the back, when exercising, or when during periods of anxiety. · Symptoms usually respond quickly to antacids. · Rarely accompanied by a cold sweat. · A feeling of fullness, tightness, or dull pressure or pain generally in the center of the chest. · Sudden chest pain or pressure that worsens. · Pain may radiate to the shoulders, neck, jaw or arms. · Pain often responds quickly to nitroglycerin. · Often accompanied by a cold sweat. So how you could know whether it is heartburn or something else? Diagnosis of heartburn is usually done on the basis of type of the pain, location of the pain, timing and radiation of the pain, things that make the pain better or worse, associated symptoms, past history, and presence of cardiac risk factors. It may be heartburn or heart attack, but both have the word heart in it. One is a painful nuisance while other is a medical emergency. It is best not to guess, dial 911, and leave the diagnosis to the doctor.